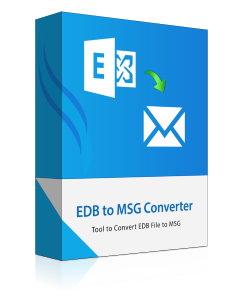 The EDB to MSG Converter Software provides the functionality to move exchange edb emails to outlook msg file format without loss of any data. It does not spoil internal integrity of data. The Exchange Data remains intact before and after the conversion of edb emails to msg. The Exchange EDB to MSG Exporter tool provides the magnificent extensibility for bulk migration of Exchange mailboxes to outlook msg. The EDB file to MSG Tool maintains the same folder hierarchy in resultant msg file also. Using the EDB to MSG tool, you can selectively export edb mailbox to msg file format. You do not need to export bulk edb files to msg if are able to transfer selective edb data to msg format supported by Outlook. Convert EDB to MSG Software have the advanced functionality to scan and recover data from corrupt edb file to msg. The exchange edb to outlook msg software provide the advance scan to extract data from edb file into msg file format. Exchange 2013 to MSG Converter Software provides the enhanced flexibility to view the content of EDB file before conversion to msg file. The Convert EDB to MSG Software maintains the same structure of edb mailbox as like in the online exchange environment. Compatible with Exchange Server 2016, 2013, 2010 & so on. The Exchange to MSG Converter Software is compatible with edb file whether it is Priv.edb or Pub.edb of almost all the versions of Exchange server such as 2016, 2013, 2010, 2007, 2003. The Resultant MSG file can easily view in MS Outlook Version 2016 and below versions. Demo version of Exchnage EDB to Outlook MSG Software allows only to preview the EDB mailbox content. Is there any limitation on the size of exchange edb file? No, There is no such limitation exists on the size of exchange edb file. The Exchange Server to Outlook MSG tool does not offer any restriction on the size of EDB file. I have dismounted or offline edb file. Does the software support it? Yes, Definitely EDB Mailbox to MSG file Supports the dismounted, offline, corrupt edb file as well. Can I use EDB to MSG Tool to recover the exchange data also? Yes, You can use the software to recover data from Exchange edb file in msg file format. What should do, when the software stuck in middle of conversion of edb data to msg? You do not need to panic or get hyper. There might be a possibility that the browsed edb file may have the high level of corruption. It takes the time to extract the data from corrupt file. How can I use the software to convert edb to msg? You have to follow the simple procedure as explained in the product guide of the EDB to MSG Converter. I have been in contiguous search for the best migration tool for Exchange edb mailbox to outlook msg. But my finding works for me when I came to know about Revove Exchange EDB to Outlook MSG Converter software for the conversion of edb data to msg file format without losing internal integrity. I use this software and from then I am one of the happy customers of EDB to MSG.